Lost In Romance is a unique album that combines 13 of Los Angeles’ best jazz musicians performing in four different trios along with soloists. The album is organized as a tale of love’s in’s and out’s, trials and tribulations, joys and disappointments—in a sequence that is best appreciated when heard in song order. The songs include traditional Great American Songbook tunes, but also step into blues and even Broadway-with “Losing My Mind” performed from a dancer’s perspective in a jazz arrangement. The album’s musicians and stellar arrangements were created by Tamir Hendelman, Steve Rawlins and Llew Matthews—all three have worked with some of the greatest artists in America including Barbra Streisand, Bette Midler and Nancy Wilson. "Singer, dancer, ingenue, Lyn Stanley is a fully realized and mature talent exploding into her own. An award-winning ballroom dancer, Stanley melds that physical experience of movement with her performance of jazz standards, bringing the genre back to its dancing, kinetic roots. 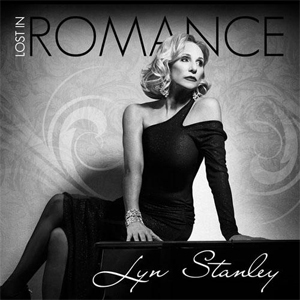 As executive producer on Lost In Romance, Stanley brings a Midas touch to the proceedings, producing in wholly urbane and sophisticated collection of the best the Great American Songbook has to offer. It takes a certain fortitude to record one more collection of jazz standards, but then again, this is the most appropriate starting place for Stanley. Standards are the proving ground for Stanley's singing philosophy and that philosophy is a sound and entertaining one.